Get creative with Divine Chocolate and Christian Aid Poetry competition! This year Divine Chocolate and Christian Aid's Poetry Competition has an exciting theme: How can chocolate change the world? This theme has been chosen to encourage entrants to think about the global cocoa industry, from the environmental and social effects of cocoa farming, to the dominance of large corporations in the chocolate market, as well as the impact of radical social enterprise players like Divine Chocolate. We are looking for as many primary and secondary schools to enter the competiton as possible. To help you deliver a creative poetry lesson we have put together a competition guide which provides ideas on how to respond to the theme and explains what it means for Divine Chocolate to be Fairtrade and farmer-owned. Our ‘Being a cocoa farmer’ resources offer a fun way to learn about the lives of Fairtrade cocoa farmers. Use our ‘Bean to bar’ presentation to find out how cocoa is grown and harvested by cocoa farmers and then made into chocolate. You could even borrow our ‘Be a cocoa farmer’ kit or request a workshop by us! A film of your poem being read by this year's guest judge, Inua Ellams, an award-winning poet. Divine goodies, book tokens and more...! The deadline for poems in English is 14th June 2019. 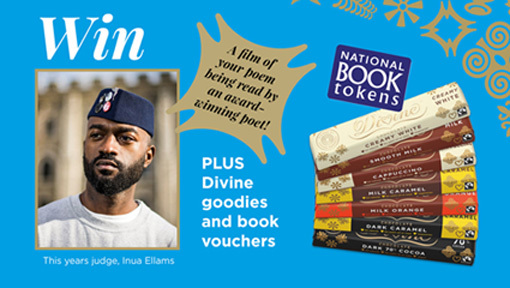 Post to Poetry Competition, Divine Chocolate, 4 Gainsford Street, London, SE1 2NE. Make sure you include both the entry form and poem(s) together! The deadline for poems in Welsh is 30th April 2019. Post to Poetry Competition, Christian Aid Cardiff, Churchgate Court, 3 Church Road, Whitchurch, Cardiff, CF14 2DX Make sure you include both the entry form and poem(s) together! The competition is open to UK residents aged 7 years and over. No purchase necessary. All valid entries recieved by the closing date will be considered. Full terms and condition apply.